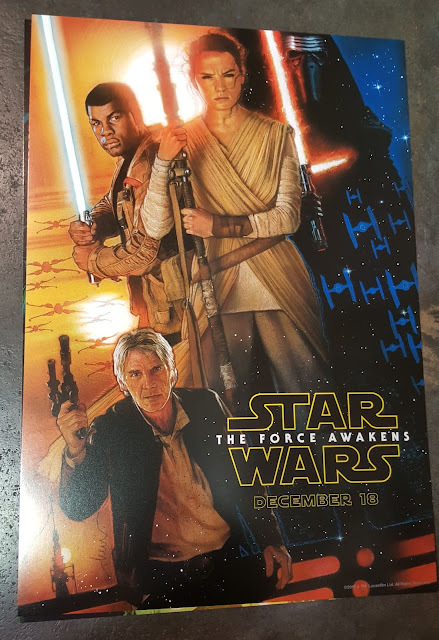 During the "Worlds, Galaxies, and Universes: Live Action at The Walt Disney Studios" presentation at the D23 Expo, a new movie poster for Star Wars: The Force Awakens debuted from the legendary artist Drew Struzan. Struzan not only created iconic movie posters for Indiana Jones and Back to the Future but for all six other Star Wars movies. Attendees were lucky enough to take home a copy of the poster after the presentation. Observant fans have noted that Finn (John Boyega) is wielding a lightsaber where he's only been seen dressed as a Stormtrooper thus far in the trailers and photos. 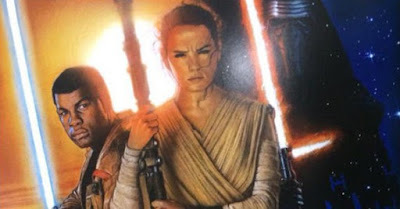 Placed front and center is a brow-beating Rey (Daisy Ridley) with the sinister Kylo Ren (Adam Driver) over her shoulder. And of course, there's Han Solo (Harrison Ford) looking very Han Solo-like just a little older. Star Wars: The Force Awakens also stars Carrie Fisher, Mark Hamill, Anthony Daniels, Peter Mayhew, Kenny Baker, Oscar Isaac, Andy Serkis, Domhnall Gleeson, Max von Sydow, Lupita Nyong’o, Gwendoline Christie, Crystal Clarke, Pip Anderson, Christina Chong and Miltos Yerolemou, the J.J. Abrams-directed film will hit theaters on December 18, 2015.